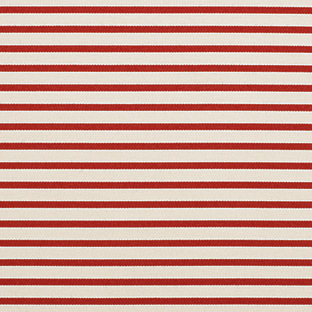 Part of the Sunbrella Select Upholstery Collection, Brittany Cherry (40322-0002) brings a bold, striped look. Made from 100% Sunbrella Acrylic, its performance benefits make it the best fabric for outdoor furniture. The upholstery fabric resists soil, stains, water, and mildew. The decorative design and functional features make it ideal for indoor or outdoor use. Use Sunbrella Select for patio furniture, sofas, cushions, and pillows. Warranty: 5 years. Width: 54 in. Weight: 8.3 osy. Sold by the yard. For more designs in outdoor furniture fabric, discover over 600 styles of Sunbrella upholstery fabrics.